Tapping Bluetooth for command and control eliminates the need for a hub, but it also means iLumi's bulbs can't be integrated into connected-home systems. But that could change. The Mark Cuban-backed smart-lighting manufacturer iLumi has announced what it’s billing as the “first and only” outdoor-rated smart bulb. The all-new iLumi BR30 Outdoor is a color-tunable LED floodlight with an IP64 weatherproof enclosure. With that ingress protection rating, iLumi ’s bulb should be totally protected from dust and rain and water splashes from any direction. At least one other smart floodlight has been announced—Sengled’s Pulse Flex—but it’s IP54 rating means it’s more susceptible to dust incursion (it will have a built-in speaker, though). Most other smart bulbs, including Philips’ Hue line, are designed strictly for indoor use. iLumi is taking preorders for the BR30 Outdoor starting today at $70 each, with delivery expected this summer. That’s the same price as its BR30 Indoor bulb, which leads us to wonder if those prices will drop as iLumi recovers its R&D investment. iLumi says the BR30 Outdoor will produce more than 1000 lumens or brightness, making them equivalent to a 75- to 100-watt incandescent bulb while consuming just 15 watts of power. The bulbs are expected to have a useful life of about 10 years. 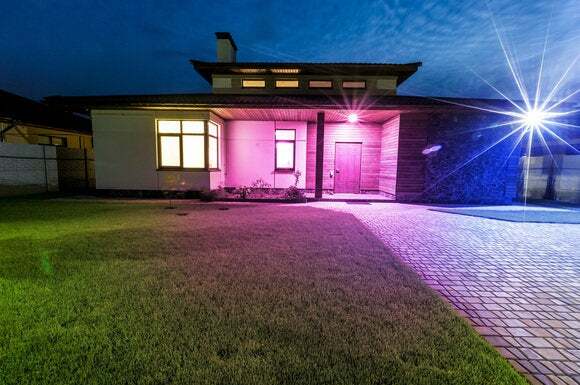 The iLumi BR30 Outdoor could be the first color-tunable outdoor smart light bulb. As with the iLumi indoor bulbs we reviewed in March, the BR30 Outdoor will be outfitted with the company’s MeshTek Bluetooth radio technology. This will enable as many as 50 bulbs to form a private mesh network that can be controlled with iLumi ’s free app (available for Android and iOS devices). Using Bluetooth eliminates the need for a hub or controller or even a Wi-Fi router because your smart device talks directly to the nearest bulb. If you need to send a command to a bulb that’s more than 150 feet away, the message will travel over the mesh network until it reaches its target. 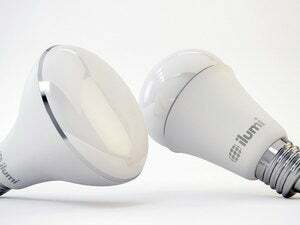 As we pointed out in our review of iLumi ’s earlier bulbs, however, reliance on Bluetooth is also the downside of its product line: Since the bulbs can’t be controlled by a hub, they can’t be integrated into a connected-home system. That means you can’t program the lights to turn on when you open the door at night, you can’t ask Alexa (the digital voice assistant powering Amazon’s Echo) to turn on the lights for you, and you can’t program your smoke or burglar alarm to trigger the lights to come in an emergency. iLumi ‘s bulbs have sufficient onboard memory so that they’re not completely dependent on a smart device. 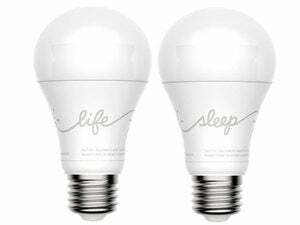 Put them in “vacation mode,” for example, and the bulbs will automatically turn on at scheduled times to deliver the impression that someone is home while you’re away. Illumi says it will have an app update “later this year” that adds support for Amazon’s Echo, Nest, IFTTT and wearables like Apple Watch and the Android Wear ecosystem. Whether or not it makes it in time for launch though is a different question. Given that so many players are trying to cash in on the smart home revolution, yet another one—especially without widespread compatibility with top platforms—seems inconvenient. From personal experience with BeOn’s own smart bulbs and its own lack of integration, I can say a seperate app is quite inconvenient.